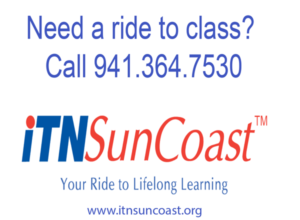 Lifelong Learning Courses in Sarasota, Bradenton, and Venice, Florida. SCALL is a nonprofit organization under Internal Revenue Code (IRC) Section 501 (c) (3) and authorized to collect charitable contributions in the State of Florida. All donor contributions are tax deductible. When you register for the Showcase, a space is provided for including a contribution. All donations will be cheerfully accepted and a follow-up notice will be provided. We sincerely appreciate any amount you are willing to share and be assured that the funds will directly enhance and support the SCALL mission. Online: Through our secure payment site. Gifts of securities: to make a gift of stocks or other securities, please contact the SCALL office at (941) 408-3723 or info@us246.siteground.us. For the broadest search results, use the "SEARCH ALL ..." selection where possible. Fewer limiting parameters return more results. Copyright © 2018 SunCoast Alliance for Lifelong Learning (SCALL). Thank you to the Community Foundation of Sarasota County and SunTrust for funding the re-design of this website. Brought to you by Rough & Ready Media.